Kane Valley is a winter paradise of pine and aspen, so any trail you choose will transition through these magical woodlands. The creeks, lakes, and snow meadows you pass add to the beauty. Also, mule deer, moose, elk and brown bears are not unheard of in the area, but the most stunning wildlife diversity here are the birds. There are Peregrine Falcons, Golden Eagles, and Great Horned Owls to name just a few. The Nicola Naturalist Society, along with the Kamloops Naturalists, is responsible for monitoring the Douglas Lake Plateau IBA (Important Bird Area). 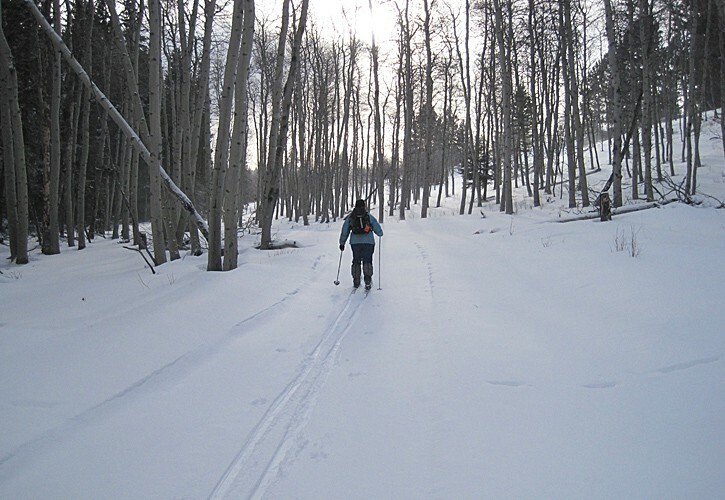 There’s nothing quite like a Kane Valley wilderness ski trail to take you away from the grind of the big city. Merritt is only 270 km from downtown Vancouver, 127 km from Kelowna, and only 87 km from Kamloops. So it’s a natural choice for a true wilderness experience. Why not plan a trip that includes more than one cross country ski experience? You can, because Merritt fits right in with a stop at Stake Lake, just outside of Kamloops, the China Ridge trails in Princeton, or Highland Valley in Logan Lake. Cross-country skiing works up an appetite, so I always appreciate a thermos of hot chocolate, coffee or tea waiting for me in the car, but there are lots options to dine in Merritt. There are many coffee shops, pubs, and restaurants to satisfy your cravings. Visit Merritt’s restaurants and pubs, but don’t forget to check out the local bicycle and cross-country ski shop, Breathe Bikes, because while you’re eating lunch they can wax your skis! Merritt, BC Canada is Mild! Worried about the cold? Don’t be, because the bone-chilling temperatures of a Canadian winter are an guilty (un? )-pleasure in Merritt, since they don’t exist! Merritt, BC is one of the mildest regions of Canada, as temperatures hover between zero and fifteen degrees below celcius, for the majority of the winter months. You can count on dressing light. It always pays to bring along an extra layer, but when skiing in Kane Valley, you will typically find that you’ve worn one too many! I wear three layers on my torso, beginning with a long-sleeved thermal. The middle layer varies according to what “extreme” temperature we are enjoying. If it’s at the colder end, the second layer is a long-sleeved fleece. If it’s at the warmer end, the middle layer is a breathe-able short-sleeved t-shirt. The outer layer is a breathe-able shell. 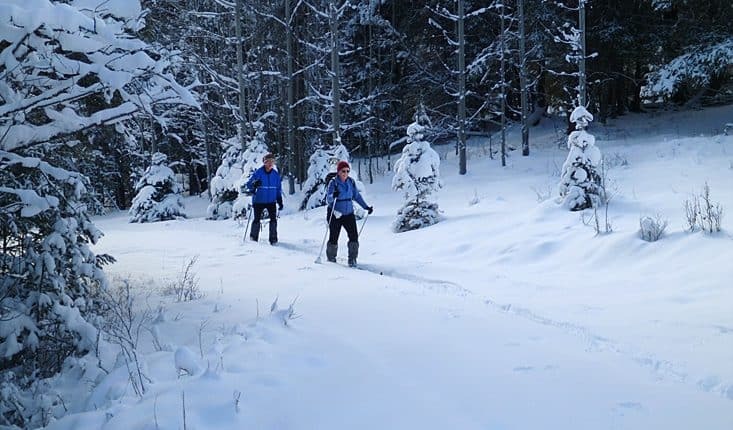 Nordic skiing provides a connection to mother nature. As a youth, I skied Little Red River Park trails in Prince Albert, and many other Saskatchewan trails, but now I am lucky enough to enjoy the quiet beauty of the wilderness experience of Kane Valley. In every place I’ve skied, I can recall moments of stillness that ground the soul, accompanied by the welcome chill of a light winter wind. 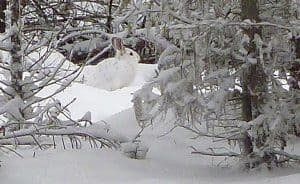 I remember the rhythmic sound of a friend or family member’s skis gliding over the falling snow, as I gazed through the sheltering boughs of hundreds of years of forest growth. If that were not enough, it is a near perfect form of exercise and a great family activity!